We have recently received two Bioloid Mini robots and we have started to experiment with them, as can be seen in the video. We have just received in our Lab a Bioloid. It's a hobbyist and educational robot kit produced by the Korean robot manufacturer Robotics. The BIOLOID platform consists of components and small, modular servomechanisms called the AX-12A Dynamixels, which can be used in a daisy-chained fashion to construct robots of various configurations, such as wheeled, legged, or humanoid robots. The Robot is programmed with RoboPlus - C language based software solution. 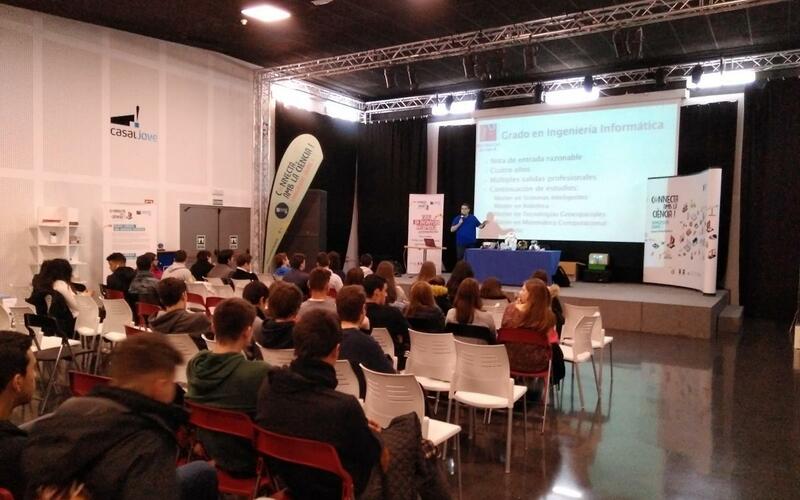 Participation in the program "Conecta con la Ciencia"
As every year, our group participates in the program "Conecta con la Ciencia", a programa organized by the Jaume I University with the aim of approaching science to high school students. On tuesday we were in Teruel with our robots and next weeks we'll be in Vinaroz and Sagunto. Today, robinlab is mentioned in El Pais newspaper supplement about research and development . tras vidas, ayudándonos en tareas ordinarias.